We believe ... that from it's opening verses the Bible emphasizes the wonder and beauty of Creation and the role and responsibility of humankind to cherish and protect "the land." We love and appreciate the beauty of the world around us, but are aware that our 21st century Western lifestyles are ultimately unsustainable. We join other people of faith in providing leadership in this journey towards a healthier, more harmonious future for Earth and its people. Through consciousness raising and practical projects we protect the Earth and promote the wise use of its resources for the benefit of people everywhere, rather than greedy consumption of more than our share. 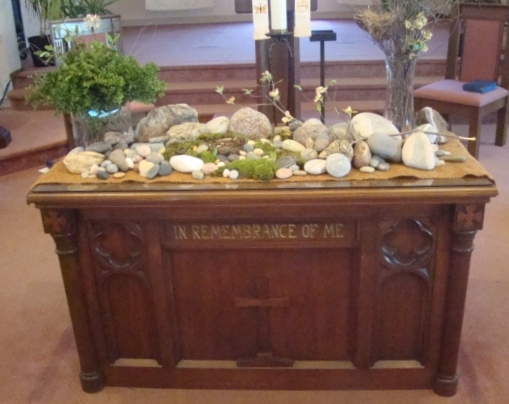 To seal our commitment to caring for God's Creation, on Earth Day Sunday, 2008, members of the congregation signed a Covenant to Enjoy and Care for Earth Community. 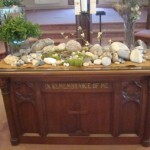 Each April we celebrate Earth Sunday with a special worship service incorporating music and dance and sounds of nature. We give thanks for the richness of the created world and pledge ourselves to protect and nurture it. We reflect with humility on the selfishness with which we in the affluent countries of the world exploit its natural resources and pollute its air and water. We pledge ourselves to use natural resources more wisely and to advocate for more sensitive and responsible public policies. 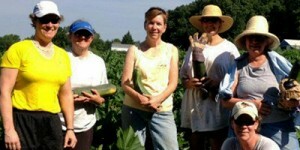 The service is followed by a hands-on activity such as stream-side tree planting. 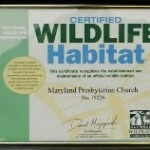 Maryland Presbyterian Church sits on four acres of suburban Oak and Tulip Poplar woodland. Like all similar woodland tracts in Baltimore County it has suffered the ravages of invasion by alien plant species and over-grazing by deer. Its structure and ecological integrity has been destroyed. 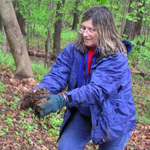 We have started on a long-term process to restore this woodland, by removing alien invasive plants, such as Garlic Mustard, Wineberry, English Ivy, Devil’s Tear-thumb, Tree of Heaven, Oriental Bittersweet and Pachysandra. We look forward to introducing native species, more appropriate for this environment. Work parties of church members and friends share this work on the last Sunday of each month. Please join us! We continue to offer forums and discussion among our members, visiting speakers and films, plus articles in our newsletter that focus on preserving creation. 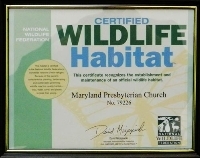 Maryland Presbyterian Church works closely with the Creation Care Group of the Baltimore Presbytery and is a Congregational Member of Interfaith Partners for the Chesapeake . Check out Chesapeake Conservation Corps Corner where Justin Gallardo, our Chesapeake Conservation Corps Intern for Uptown Metro Ministry Group, will be keeping us up to date on all of the exciting work that he is doing to promote the Environmental Stewardship Mission of MPC and other local churches.